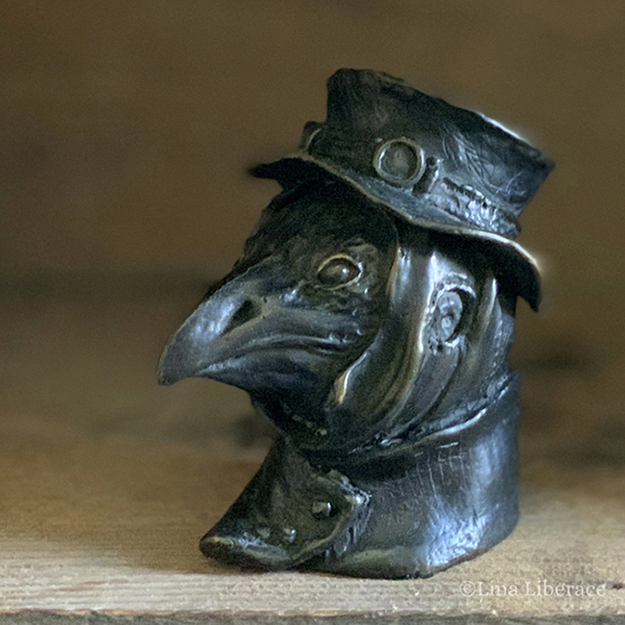 “Steampunk Crow,” in Bronze, 4×4 in. 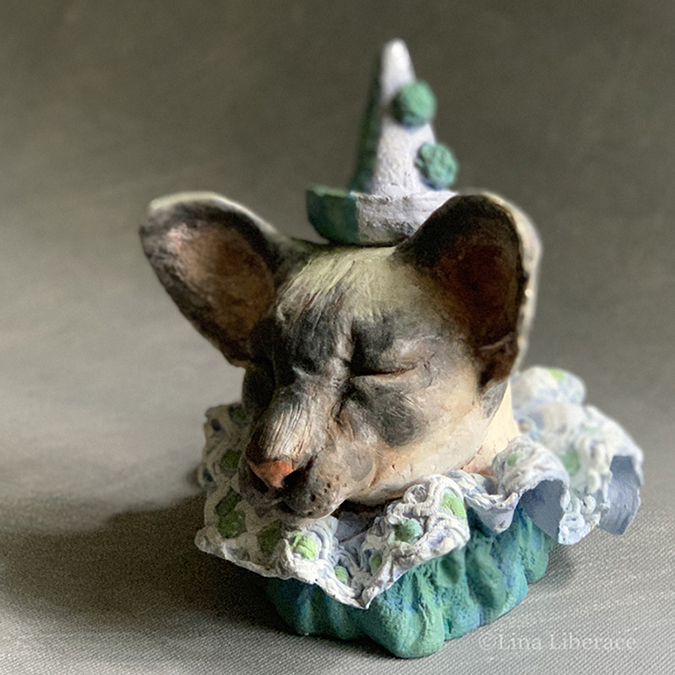 “Basking Siamese,” paperclay, 4×4 in. 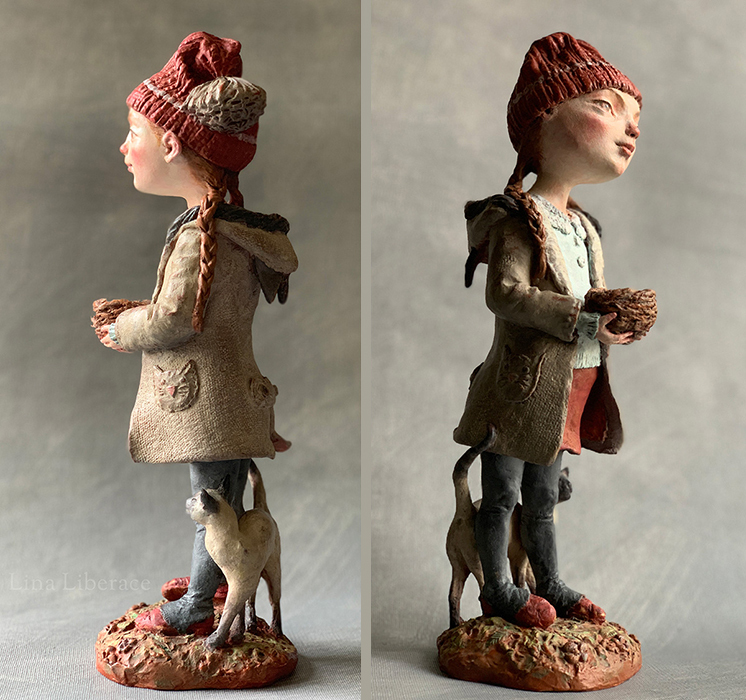 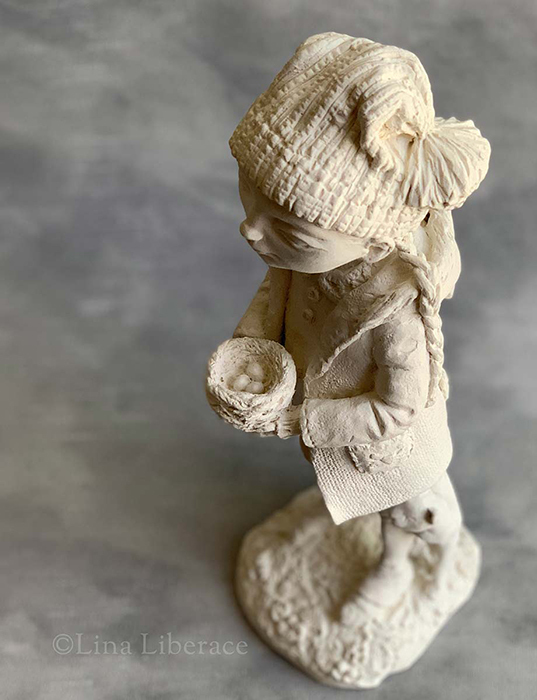 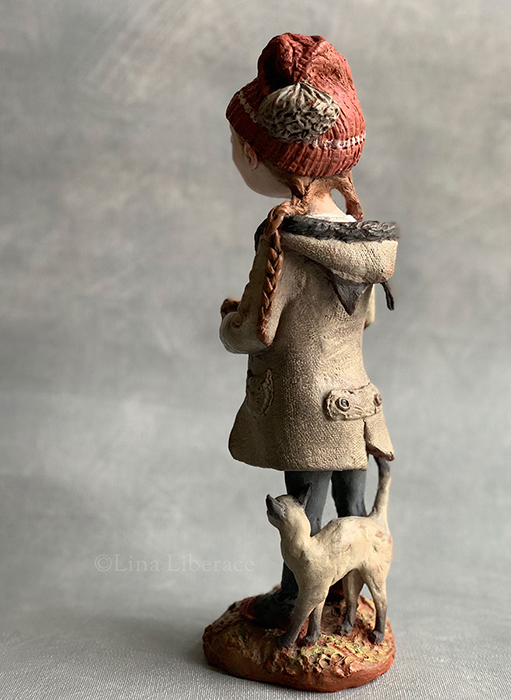 “The Foundling,” paperclay and acrylic, 3×3 in. 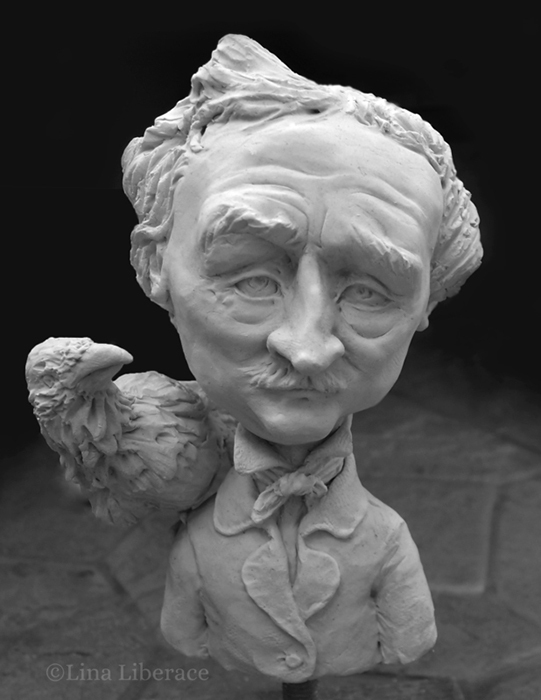 “Poe and Friend,” unpainted, paperclay, 5×11 in. 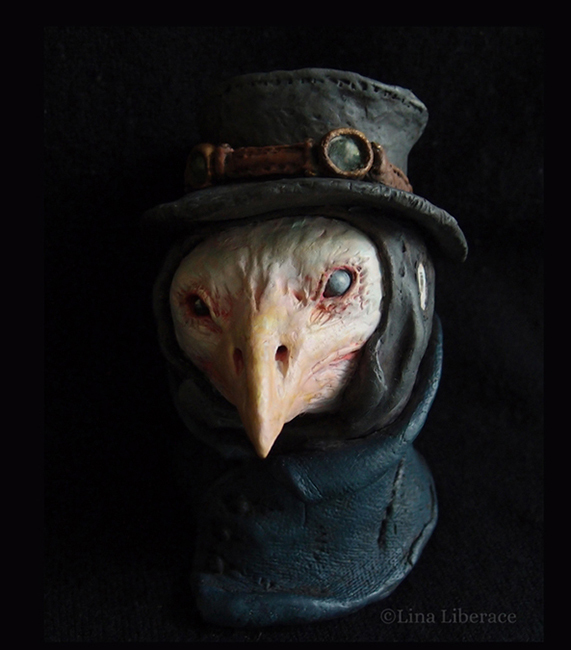 “Crow in White,” paperclay and acrylic, 5×5 in. 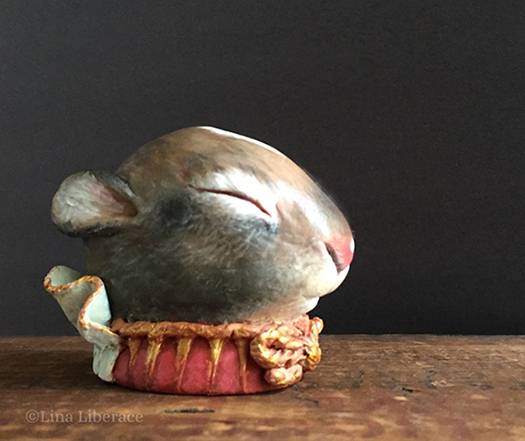 “The Nest,” paperclay, 12×4 in. 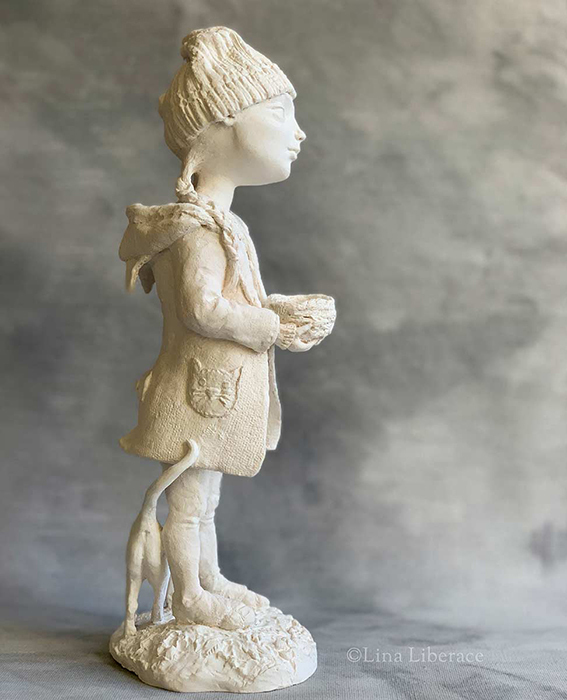 Sculpture,” The Nest” paperclay, 12×4 in. 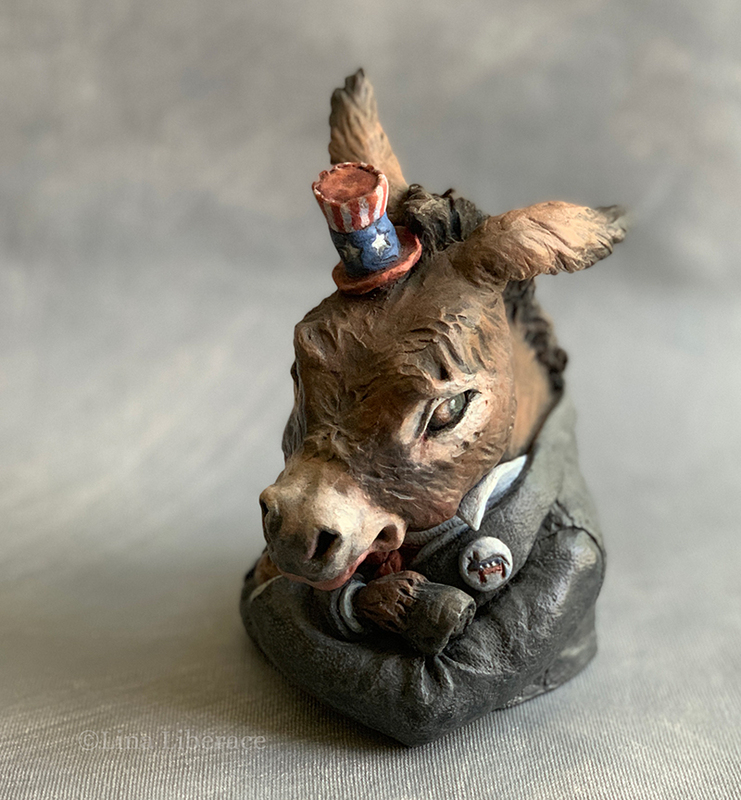 “The Nest,” side, paperclay and acrylic, 12×4 in. 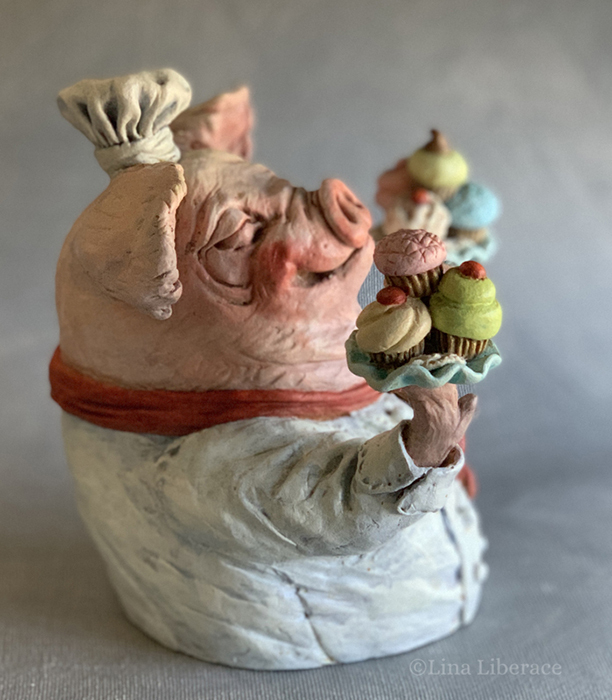 “Cupcakes,” side, paperclay and acrylic, 6×5 in. 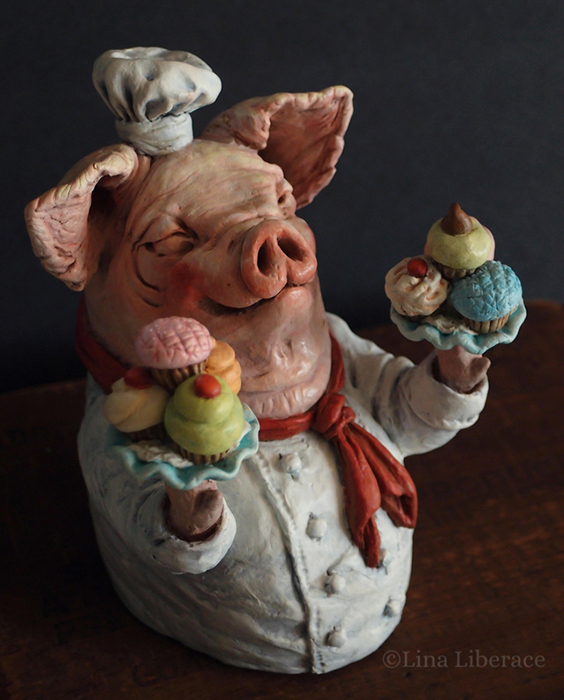 “Cupcakes,” paperclay and acrylic, 6×5 in. 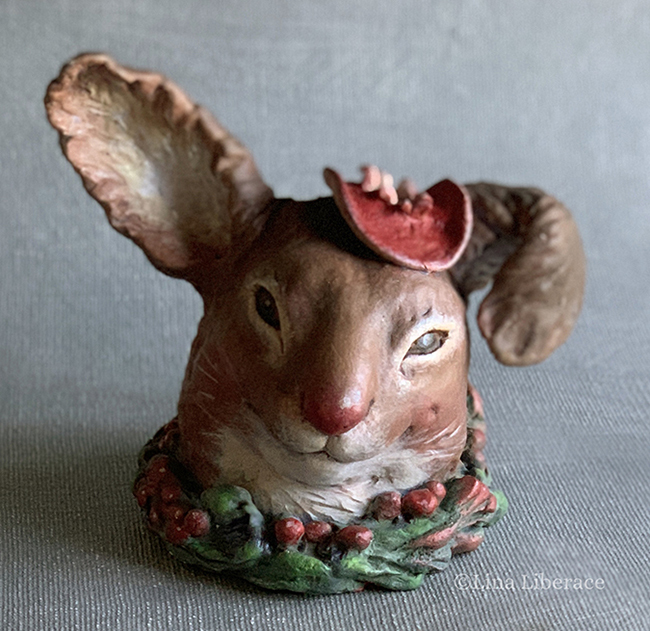 “Spring Cabbage,” paperclay and acrylic, 8×5 in. 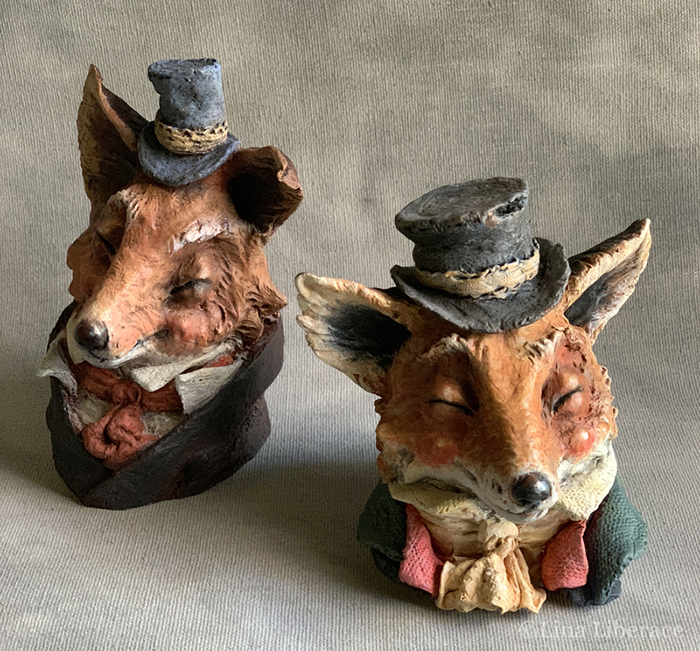 “Dapper Foxes,” paperclay and acrylic, 4×4 in. 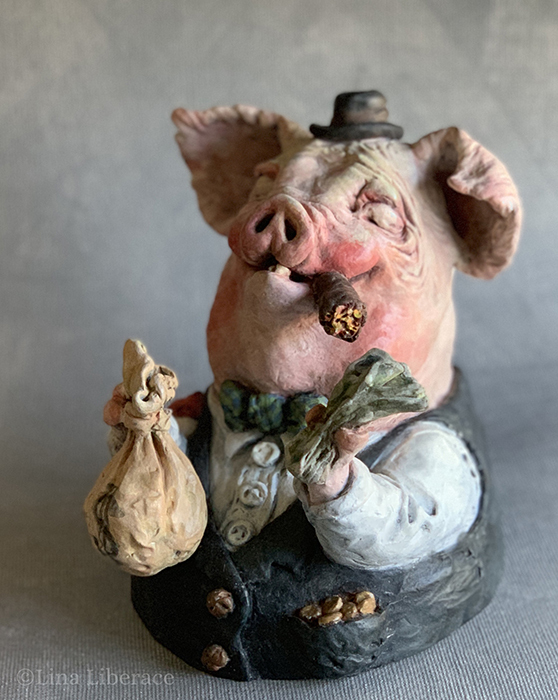 “Piggy Bank,” paperclay and acrylic, 6×5 in. 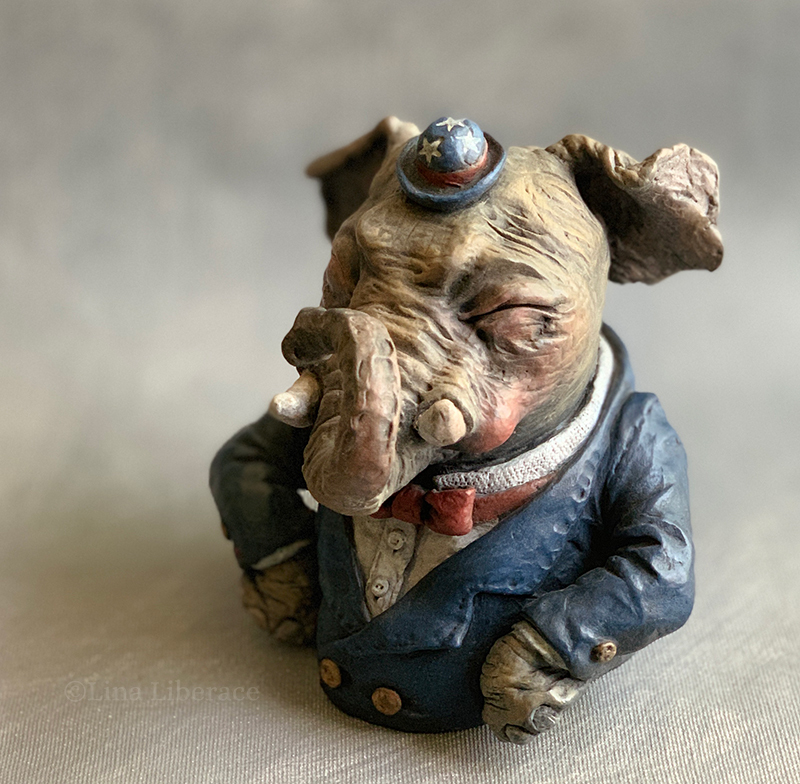 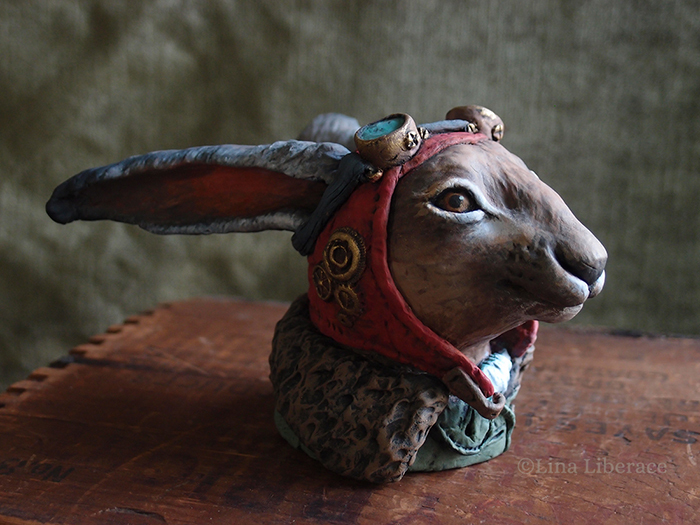 “The Aviator”, paperclay and acrylic, 6×4 in. 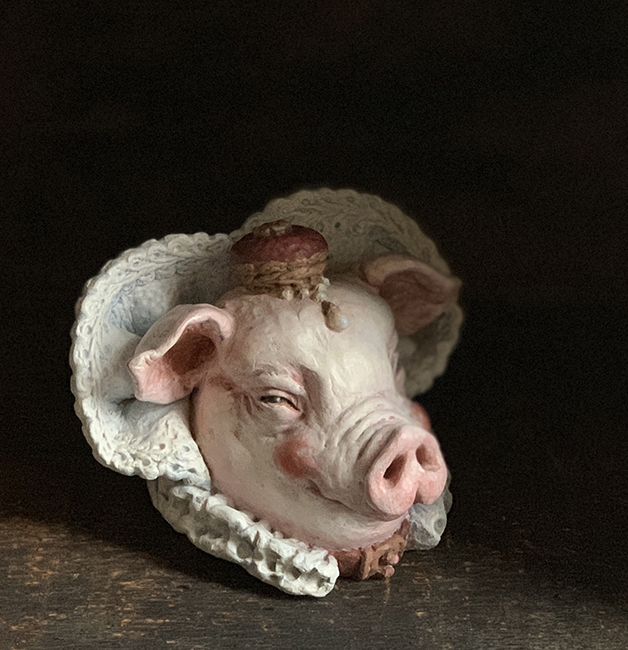 “Sprout,” side, paperclay and acrylic, 8×5 in. 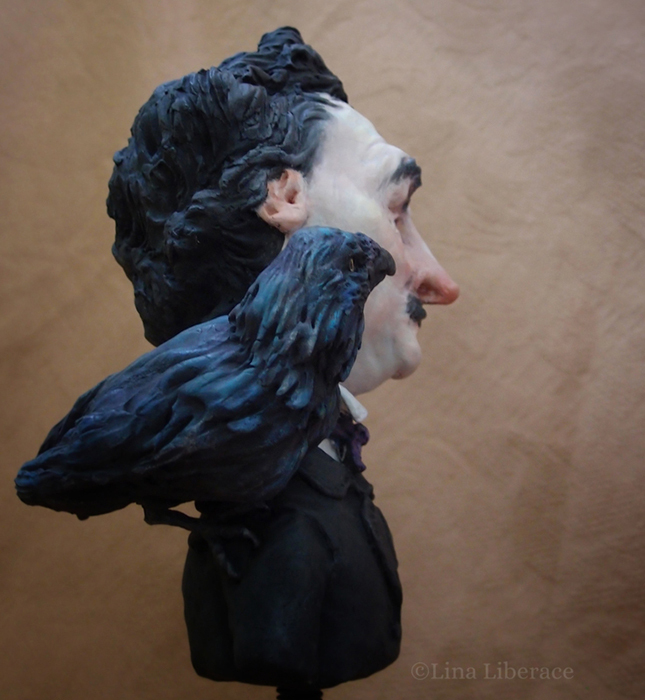 “Poe and Friend,” paperclay and acrylic, 5×11 in. 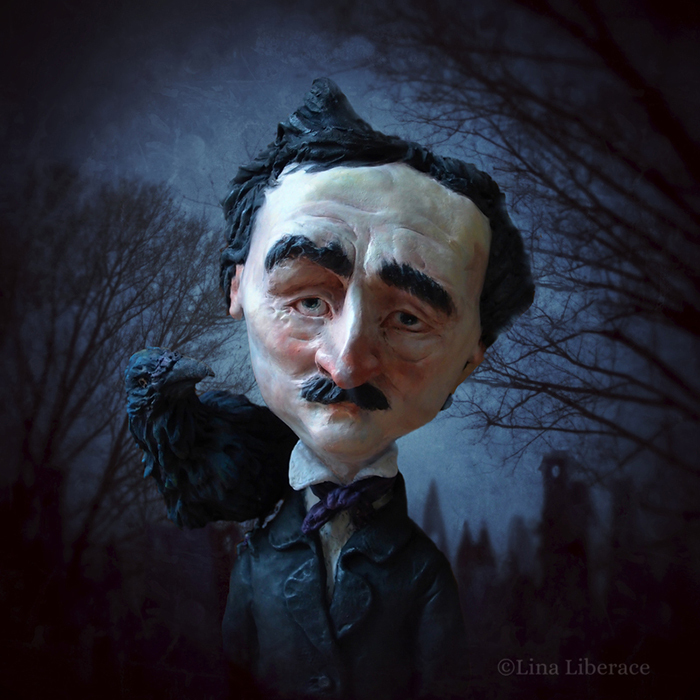 “Poe and Friend,” paperclay, acrylic, photography, 5×11 in. 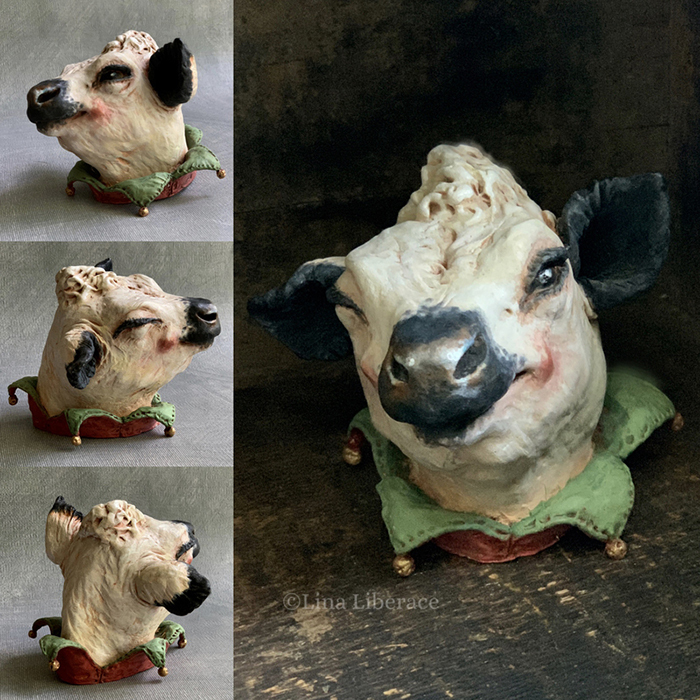 “Winking Bessie,” paperclay and acrylic, 4×4 in. 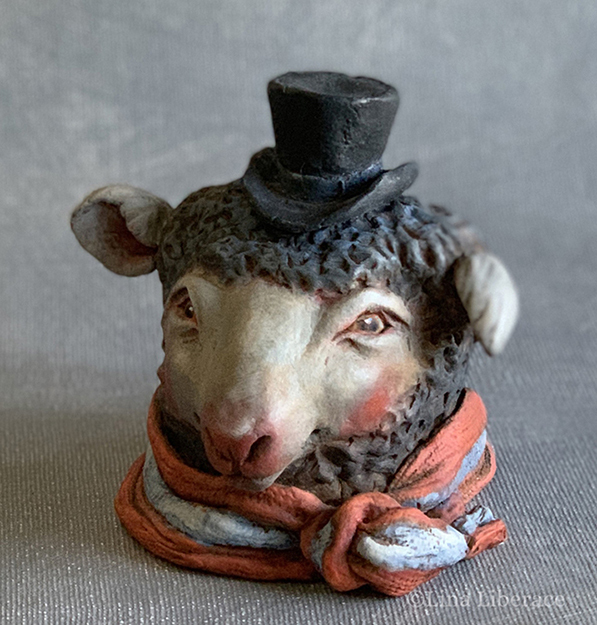 “Holiday Greetings,” paperclay and acrylic, 4×4 in. 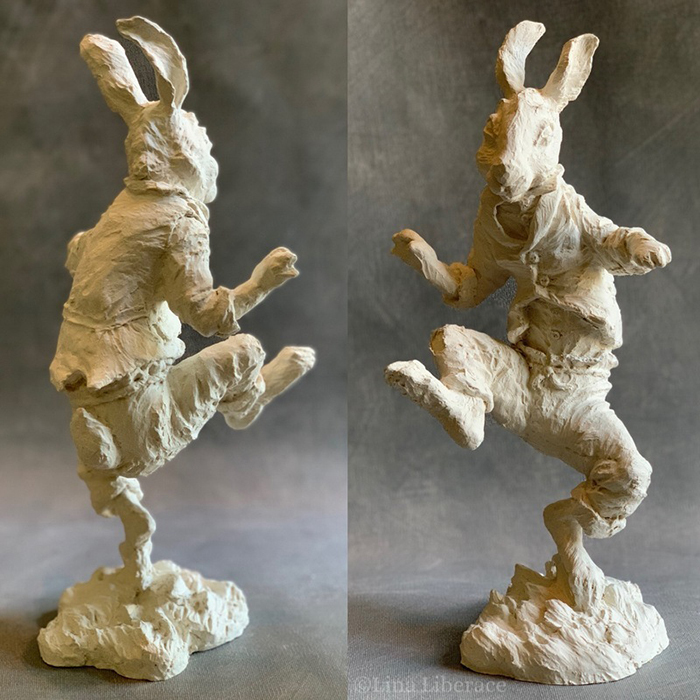 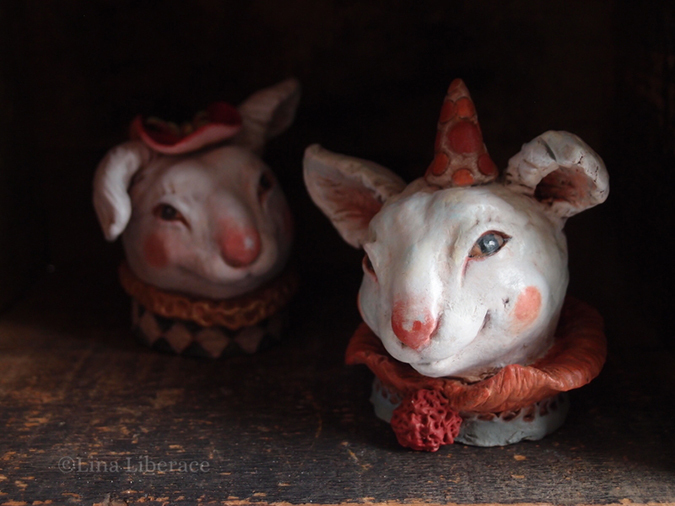 “White Rabbits,” paperclay and acrylic, 3×4 in. 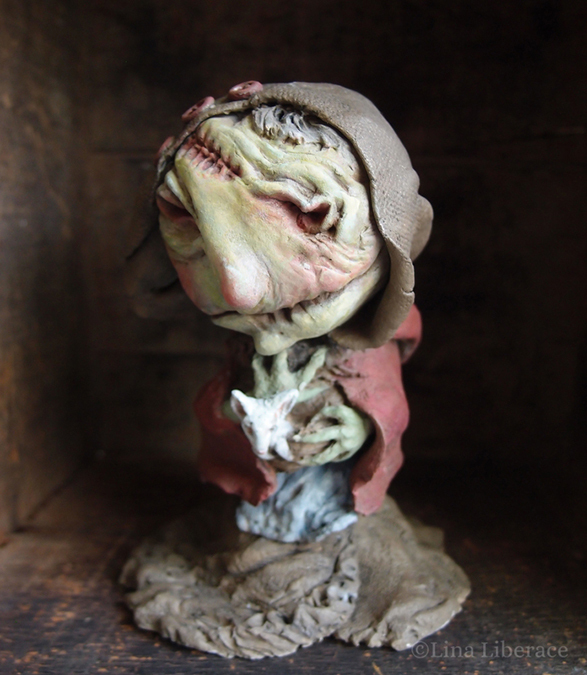 “Goblin,” paperclay and acrylic, 4×6 in. 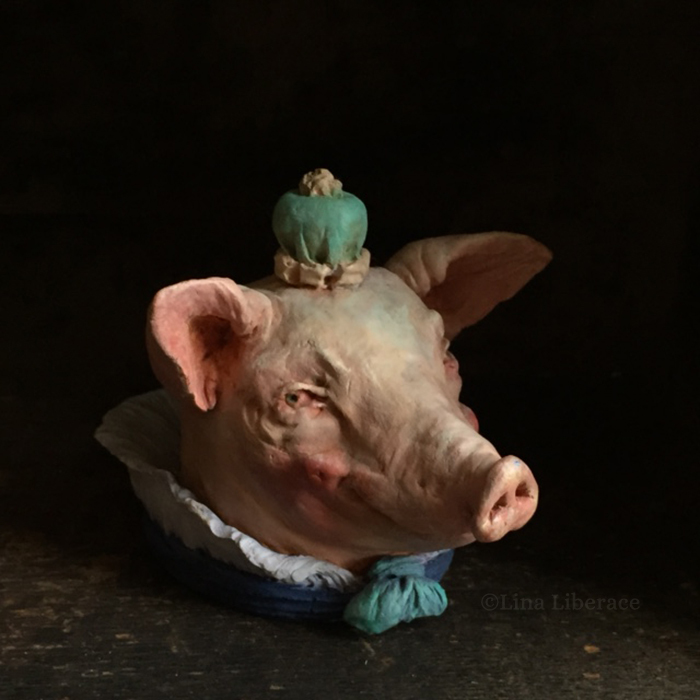 “Spring Cabbage,” side, paperclay and acrylic, 8×5 in. 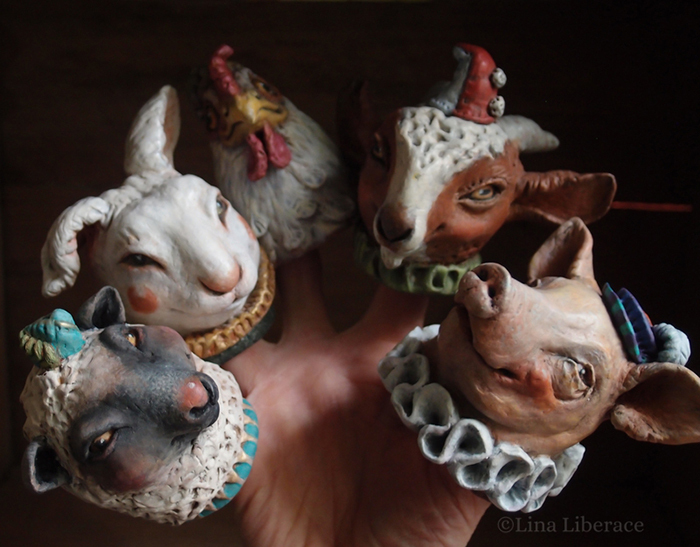 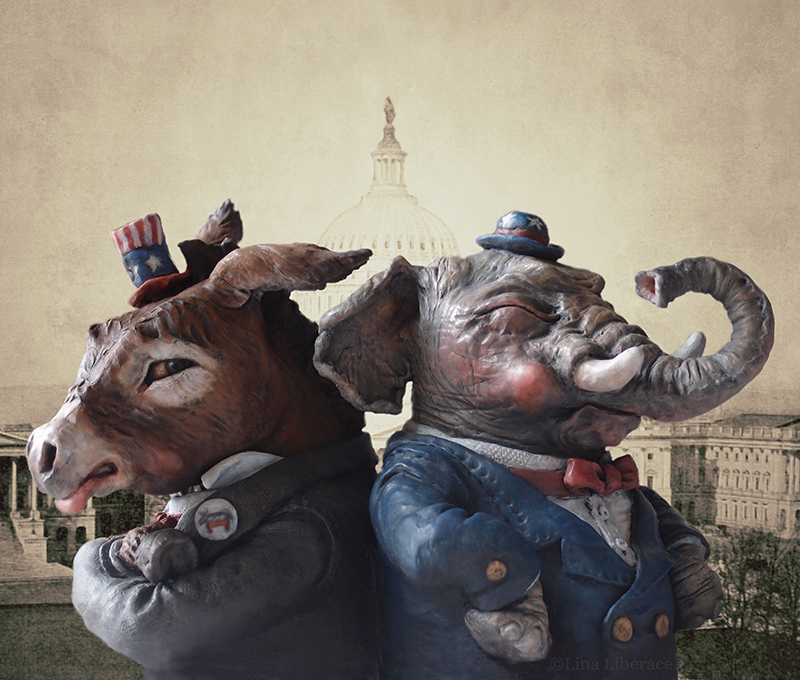 “Handful of Puppets,” paperclay and acrylic, 4×4 in.